Traffic passes through a newly repaved U.S. Highway 6 in Dillon. The CDOT project is the site of repeated improper erosion controls by the contractor that has led to prohibited chemicals escaping into local stormwater drains. On at least three occasions documented by a whistleblower this summer and described in a July story by the Summit Daily that also appeared in the Post Independent, a contractor for a repaving project in Dillon allowed prohibited materials to seep into area drains due to insufficient control measures. Such controls are a necessity to prevent pollutants from entering state waters — in this case along U.S. Highway 6 into the lower Blue River, and from there the Colorado River. And according to Dillon officials, mitigation devices to prevent oil discharge exist in inlets on one side of the highway but not on the other. The result is any illicit materials could pass through unfettered and head downstream. 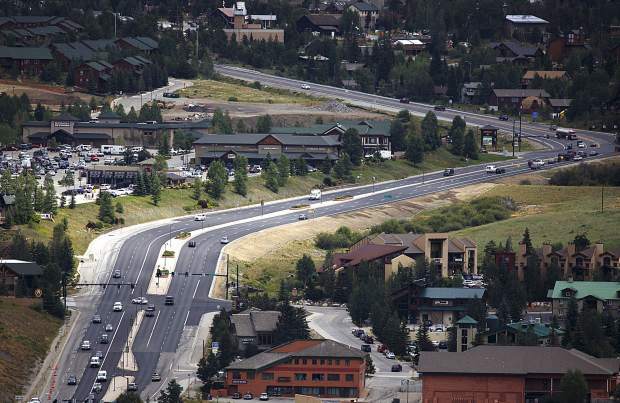 The Colorado Department of Transportation acknowledged separate water-related incidents on the repaving project near the Dillon Ridge Shopping Center where contractor APC Southern Construction Co. had inadequate controls in place. In one instance on May 8, for example, liquid asphalt ran into the drains due to a heavy rainstorm, followed by more materials leaving the site in July from further noncompliance. In response to a Summit Daily inquiry, CDOT initially stated a stop-work order, which halts all operations, was issued on July 20 after a subcontractor was photographed dumping at least a gallon of wastewater from a bucket into a storm outlet the day before. A subsequent letter sent to the Daily by CDOT’s regional engineer confirmed two additional stop-work orders during the course of the project to bring it back up to proper code. CDOT also took issue with the Daily’s spotlighting these prohibited discharges, reiterating that although they did occur, they did not officially meet the criteria of a spill according to the Colorado Department of Health and Environment. Pictures and videos provided by the whistleblower showed pools of water containing liquid asphalt, remnants of concrete and oil slicks all going down nearby drains. Beyond that, the reporting of chemical and other pollutant spills into stormwater drains from road paving projects is not mandatory for the bulk of Colorado’s High Country. This includes headwater regions like Summit County. Federal regulations adopted through the Environmental Protection Agency in the 1970s under the Clean Water Act require informing the proper response agency of any petroleum discharges. However, the state’s health department provides exemptions in situations where the threat to water quality is deemed “low risk.” The releases of oil-based paving materials, concrete runoff and equipment wash water in Dillon fall into this category, therefore avoiding the official definition of a spill. In addition, Summit County does not fall under an elevated discharge permit mostly due to its rural composition, which means all construction projects here have a higher threshold for when pollutants must be reported. Aside from Colorado’s heavily populated urban counties, only Grand Junction and Steamboat Springs within the Western Slope presently maintain this designation. State and local officials noted that the reality of both road construction and general use of automobiles is that small amounts of chemicals often enter Colorado waterways. Banned substances like drops of oil, leaks of antifreeze and bits of rubber from tires left on roads or in parking lots are frequently sent into drains every time there’s a rainstorm. Still, the emphasis remains preventing as much of these materials as possible from going down the drain. And whether Summit and other neighboring Western Slope communities meet the qualifications for ramped-up safeguards, regional authorities on water expect best efforts and management practices in place to avoid potential consequences down the road.